Flu Shot Ingredients - Are They Safe? Thimerosal is one of the most troubling flu shot ingredients, because most of these vaccines contains mercury which is known to be harmful to humans and especially to children. There is warnings on the package of many vaccines, but as a patient you do not see the package, only the needle for the shot being given. Some medical professionals and experts believe Thimerosal and other vaccine additives cause autism in children, but the courts have found that this is not the case due to a lack of convincing evidence. Flu shot reactions can range from minor and uncomfortable all the way up to life threatening or even fatal side effects. Squalene is another one of the questionable and potentially dangerous flu shot ingredients. This compound is found in vaccines made in Europe, but many American vaccines do not contain this adjuvant because of the possible risks. 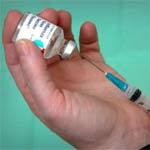 Adjuvants are used in the H1N1 flu shot and other flu vaccines to stretch the vaccine further, so more doses are created. This does not improve the safety of the vaccine, but it does improve the bottom line of the vaccine maker. Some of the questionable flu shot ingredients include antibiotics, which do not help with viral infections but are used to kill any bacteria in the vaccine. These antibiotics can cause allergic reactions in some patients. In addition these vaccines are incubated in animal tissue, which can lead to unintentional contamination with unknown or undetected animal viruses and other pathogens. In some rare cases the swine flu vaccine side effects and reactions to other flu vaccines can cause more complications than simply catching the flu.